Discussion in 'Maintenance, Tinkering & Embellishment' started by wootzblade, Nov 25, 2017. Includes data for all traditional sharpness tests. Littlebabycarrot, fotobaerchi, GABaus and 8 others like this. Very interesting reading Wootz, what prompted you to put that together? It was my first time hearing of the BESS. Interesting. Does the BESS typically scale directly to the edge measurement or are there other factors involved? Thanks for sharing! Sounds like I need to step up my sharpening game! This definitely belongs in M,T&E. EDIT: thanks to whoever moved it from general. I have a problem with that chart regarding edge reflection vs sharpness. How were the edge widths derived? They seem of a bit. We, Knife Grinders, did this study for the Australian Knife Magazine, this chart is just a summary of a long and thorough study done. BESS edge sharpness testers are calibrated to tell edge apex width by the score on the BESS scale. The lower number on the scale, the sharper is the edge, e.g. DE razors score 30-50, a utility knife blades score 150-200, and your kitchen knife will probably score 300-400, etc. The correlation was established by comparing sharpness scores the edge gives on the instrument with SEM measurements. 0.1 micron edge scores 50 on the BESS scale. Even though to a first approximation, the sharpness score gives us the edge apex width. This correlation has been proved by a number of direct SEM measurements and is almost linear in the scale range from 20 to 500. Great resource, been looking for something like that. Thanks for putting it online. You should take that and maybe create a forum sticky here. I am always trying to figure out how to assess--and refer to--how sharp something is. You know, how we sharpen and check if the edge reflects the light, and keep grinding till the edge doesn't reflect the light anymore - meaning the both sides of the edge have met at the apex. The visible light wavelength is 0.4-0.7 micron, so if your edge reflects light it is at least 0.8 micron wide at the apex, and this is a dull edge. When you can't see light reflected from the edge, it means you've sharpened the edge to 0.4 micron width; the light wave literally bends over the edge that is too narrow to reflect it back. And 0.4 micron edge is a sharp edge. There is a thread on the BESS forum www.bessex.com explaining that better. I feel there's way too many variables when it comes to edge reflecting light vs sharpness unless the exact conditions are stated, and can be duplicated by us laymen. What light source, How bright? What background, How dark? Is that with uncorrected 20/20 vision, and/or under magnafication? For instance, in my house with ambient light, at my sharpening station, with corrected vision, My edges start to shave long before the edge stops reflecting light. When the reflecting disappears, it's cutting clean patches with the grain, and starting to shave against the grain. Shining a cheap 30 lumen LED flashlight against the edge against a dark background, I see significant edge reflection. By the time I no longer see the light reflect with flashlight and dark background, it will shave cleanly against the grain. At this point I can look at it under 5x magnafication and see a lot of reflection. This is quite a bit different than what's stated in your chart. It would also be nice to know what type of sharpening media and grit/micron was used to achieve each stage of sharpness. ...and that creates the intrigue that drives our interest and studies further. There certainly still way more questions than answers. BTW, these edge sharpness testers are produced in Phoenix, Arizona, by Mike Brubacher. 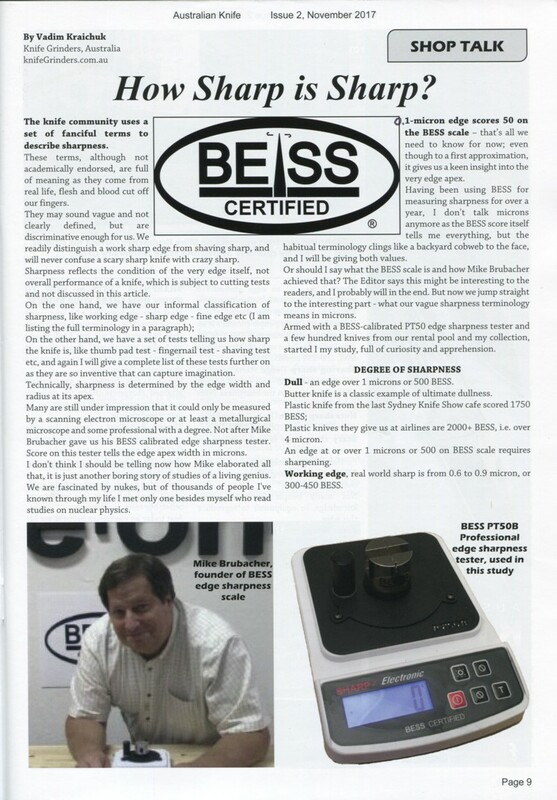 Knife Grinders is the BESS instruments distributor in Australia & New Zealand, and a sharpening study lab there. The Mike Brubacher's website http://edgeonup.com has a Library section with more info on what we discuss here. The "KN100 Operating Manual" is not only about that particular instrument, but also rich with observations on sharpening and sharpness testing in general, and worth having a read. Another one giving general insight is the "SUPORT DOCUMENT For All Edge Tester Models"
For instance, in my house with ambient light, at my sharpening station, with corrected vision, My edges start to shave long before the edge stops reflecting light. It seems like I have had a number of edges that did not reflect light but were no where near shave sharp. Specifically stock edges from the slippy makers come to mind, Case, SAK etc. . . . no light reflected and definitely no shave, shave. Pretty much I only look edge on for light to see if I have dings or flat spots. And this is with a close focused jeweler's visor which I use for all my sharpening by hand. The way I sharpen I shine the light differently to see a bur (very slight bur only / ever) and I am shining the light roughly from the spine toward the edge . . . mostly from above with the blade held roughly parallel to the floor but angled up some. I haven't paid much attention; I just do it. So yeah I am going to have to pay more attention to this. As I keep harping in other threads . . . for sharpness testing my thumb nail with the edge biting into it at a shallow angle tells me scads about the edge and I can tell shave(ish) sharp from hair whittling just from my nail test and can easily tell if the angle is too wide and needs to be reprofiled some . . . among other feed back. Trying the knife angled both ways tells me if I have areas that are a slight bit burred and angling (a weak edge needing further refinement). We went through this before. It seems to me that the BESS system had some problems, with different people getting different results and results being inconsistent. For a while, Ankerson was adding BESS scores to his edge-wear results, but then he stopped and removed them. Don't know why. Not familiar with BESS system or those measurements. But I found the simple home sharpness tests indicated in the guide were quite useful as a loose indicator/guideline of "level of sharpness" I'm getting on a specific knife, without having to go thru a bunch of contortions and funky testing to figure it out. I find the document useful mainly for that. Also: even if their effort and data are not perfect and need to be refined, I totally appreciate the ATTEMPT to make this more objective and data-driven than it often is. It's the difference in brightness of the light shining on the edge (LED desk lamp) vs the dark background I'm holding the knife against (dark area underneath my desk). What I can see under those conditions, I can't see out in the middle of the room. High contrast and my eyes adjusting to the dark background are probably key. I've also noticed this outside in bright sunlight holding the knife against a dark shadowed area. Along with the light reflection thing, I have to question the other "traditional sharpness tests" that are listed on down the page. I agree it's useful, just don't expect the same results someone else gets with those tests. They won't be doing them under the same exact conditions you are, that's all I'm saying... way too much variance from person to person. It's the difference in brightness of the light shining on the edge (LED desk lamp) vs the dark background I'm holding the knife against (dark area underneath my desk). . . . I've also noticed this outside . . . against a dark shadowed area. I tried out the BESS system, and while it is well-thought out I ran into issues. When testing an edge and it severs the line with a pull but not a static rest at the same load value, is the edge dull, or sharp in a way the test cannot account for? In my own testing I have seen an inverse relationship between the edge finish and draw or pressure cut - the BESS being biased toward pressure cutting. Often the rougher edge cuts far more easily than the refined edge at a given pressure, if any edgewise movement is included. Chris "Anagarika" and Lapedog like this. So what you are saying is that this system only is really appropriate for testing push cutting, and therefore an edge that would excell at push cutting will excell at this test? So a refined smooth (not toothy) edge is going to score high here even if that edge isn't necessarily ideal in real world use. Personally I find that looking for light reflecting off the edge is not a very good way to test sharpness. Especially because I am often sharpening in different lighting conditions. I also find it hardest to see what is going on when I am sharpening with a strong overhead light. This is because as I lay the edge flat on the stone the edge reflects the light back making it difficult for me to see. I use a combination of laying the edge on my finger nail and trying to drag it to one side and then the other to see if it is only catching in one direction. (Rolled edge) I test this up and down the edge. I also slowly slice a piece paper to test the edge for chips. I make sure to drag the edge from heel to tip. If the paper catches that is likely a chip. Those areas get a little extra love.